I have an existing Relyon bed and I can confirm they're well built and of good quality. A number of mattresses are available, I've posted this one as it suited my requirements, but Superking size is also available. This single sized Reylon Luxury mattress comes in a beautifully handcrafted design, and features 1800 pocket springs upholstered in luxurious fillings to provide you with a high level of comfort and support. The pocket springs are arranged in 2 layers. The top layer moulds to the contours of your body, whilst the bottom layer adjusts to your shifting weight as you sleep at night. This mattress provides you with a medium level of support. One of the secrets of a great night's sleep is the quality of the support given by your mattress. This Luxury 2200 single pillowtop mattress from Relyon has a soft sumptuous surface, with cashmere and silk fillings, and latex. The pocketed springs shape to the contours of your body to provide all the support you need. You can rely on this super king size mattress to help you to get a good night’s sleep. The Relyon Luxury 1500 is beautifully made with independently pocketed springs and luxurious fillings for added comfort. The springs shape to the body, providing superb resilience and optimum comfort and support for a refreshing sleep. The Relyon Luxury 1500 mattress has a 5-year manufacturer’s warranty. This super king sized Reylon Luxury mattress comes in a beautifully handcrafted design, and features 1800 pocket springs upholstered in luxurious fillings to provide you with a high level of comfort and support. The pocket springs are arranged in 2 layers. The top layer moulds to the contours of your body, whilst the bottom layer adjusts to your shifting weight as you sleep at night. This mattress provides you with a medium level of support. I know I was also after a double - the prices for similar quality mattresses are horrendous. I'm gutted SUPER KING is available having just bought one a month ago, would have preferred one of these! For info single sized mattress protector also on offer. Hi matt20, could you confirm this is the one you're talking about? 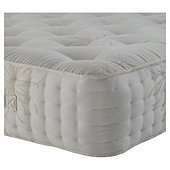 I want a firm feel mattress and fell in love with the Hypnos ones but it's so expensive! Thanks.